I’m so proud of myself right now. I can’t help it, just look at the pie, my very first pumpkin pie. Oh, did I mention the filling is made from scratch too? Despite the idea of making things from scratch is impressive in my book, I’m convinced that I’ll need a shortcut for the filling next time. Some of you will agree that peeling through the stubborn exterior of a pumpkin (actually about a quarter of a Japanese pumpkin) and cutting it into pieces are no piece of cake, especially when you’re relying on an old and blunt generic knife to do the job for you. I should have used pre-made pumpkin puree instead. I should have. At the end of the day, I don’t think it’ll make much difference, am I correct? 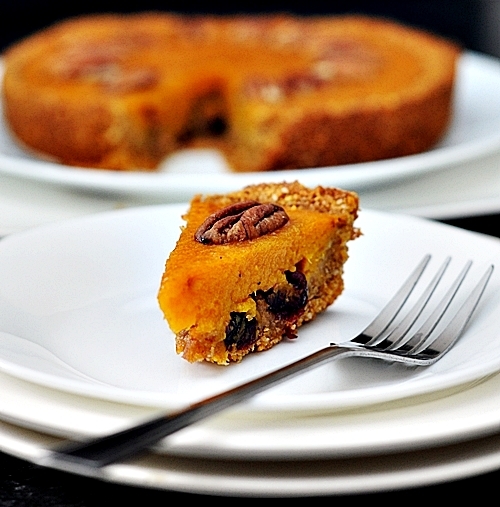 Even if there is any difference, there’s nothing nutmeg and cinnamon can’t fix right? Note: I’ve doubled the peanut butter and honey as the portions provided in the original recipe don’t seem to create a mixture sticky enough to form a pie shell. I would start with 2 tbsps each for peanut butter and honey. Add more until you achieve the desire consistency. For me, it took me up to 4 tbsps for both ingredients. 1. Roast diced pumpkin in a preheated oven to 200 degrees Celsius / 392 degrees Fahrenheit for 20 minutes or until tender. Set aside to cool. Reset the oven temperature to 165 degrees Celsius / 330 degrees Fahrenheit to continue preheating the oven for baking the pie later on. 2. 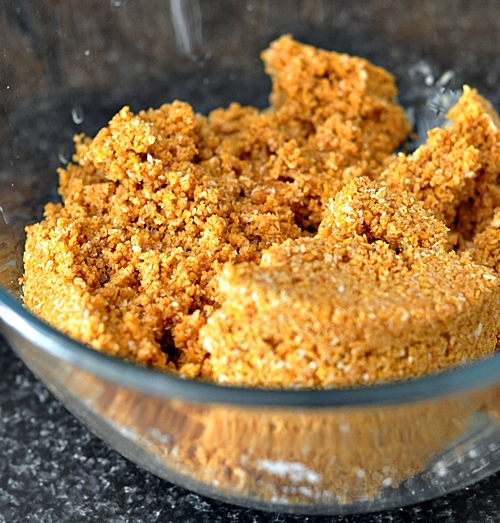 To prepare the crust: Combine the cornflakes, coconut, pecan nuts, peanut butter and honey in a food processor. Blend until the mixture sticks together when squeezed. 3. Press the cornflakes mixture down on a pie dish to form a base and bring a little way up the sides. If you’re using a cake tin, make sure to line the cake tin with parchment paper. 4. To make the filling: Put the pumpkin, maple syrup, orange zest and juice, vanilla, spices and egg whites in a food processor. Process until well combined. 5. 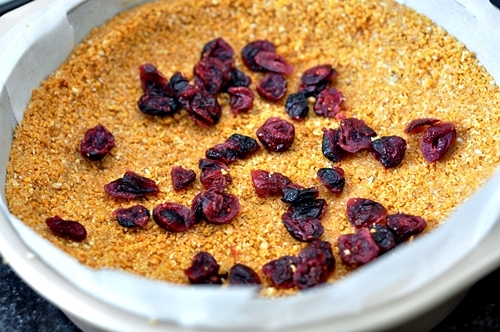 Sprinkle the dried cranberries over the base of the pie shell (picture below) and spoon over the pumpkin mixture. 6. 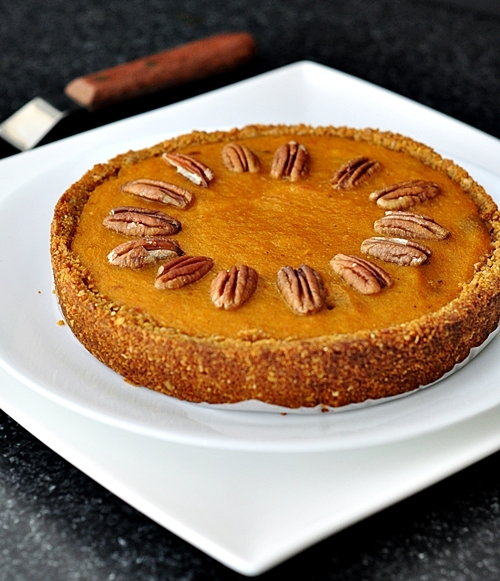 Top with the pecan nuts and bake in the oven for 30 minutes or until the filling is firm. Cool. Serve chilled or at room temperature. Emily – as always, wonderful wonderful photos. I agree, peeling/cutting pumpkin is so hard! I always feel like I’m going to chop off a finger. I’ll admit, the only times I’ve used actual squash is when it isn’t pureed in a recipe. Otherwise I’ll just use canned. It’s funny because I get all excited when fall rolls around so I can make pumpkin recipes since they are in season… but then reach for a can. Your pie looks absolutely delicious and I love the addition of cranberries for the extra tang! cornflakes + peanut butter for a pie crust? OHMYGAWD that is freaking brilliant!!! i loooveeee cornflakes! i can’t even begin to imagine how awesome this is gonna taste eeee i need to go home and bake! I was asking about the gluten-free because my boyfriends father has Celiacs and we’re going there for Turkey Day this year.. I actually think this might be- because corn flakes are gluten free and everything else seems to be as well.. something to think about 🙂 thanks! I have celiac and had the exact same thought. Be careful though. 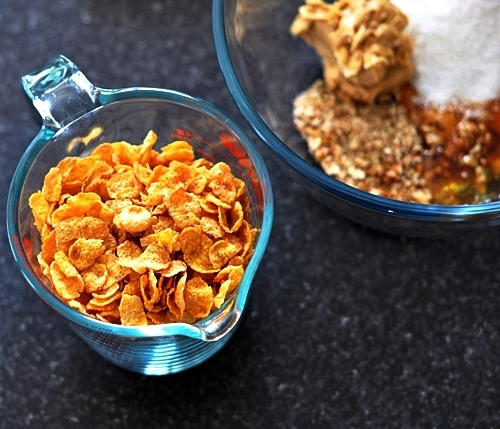 Make sure the cornflakes and all other ingredients are truly gluten free. Call your boyfriend’s father, if you can, and ask him if there is a particular brand of cornflakes he eats. Go through the rest of the list too. Trust me. He will really appreciate the gesture. I tear up nearly every time someone just tries or asks. I love the cornflakes idea! 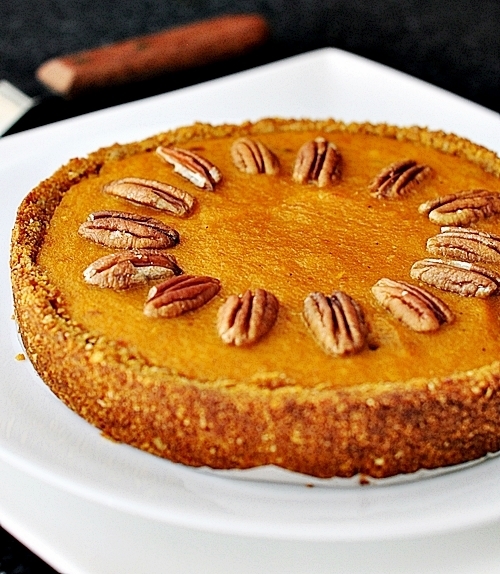 Do you use the pumpkin raw or do you actually cook it before using it in this pie mixture? I already had the pumpkin so yesterday I prepared the puree. Next on my list is preparing this pie! If I choose to use the pumpkin puree, what amount should I use? About 2 cups (or 500ml) of pumpkin puree shoud be enough. Happy Thanksgiving ! What a creative pumpkin pie! I love the use of peanut butter in the crust and dried cranberries under the filling. Delicious combination of ingredients! Sounds really lovely, but I think it would be much better to make the filing from scratch – you can control the ingredients better,and the flavour will be much nicer as well. 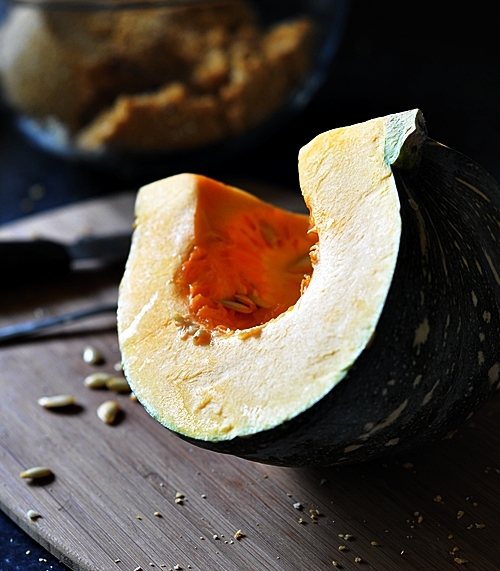 To make the pumpkin preparation easier, you could roast larger pieces of it with the skin on, and then just peel or cut it off once it has cooled down after roasting. Your pie looks very nice and think it taste lovely too. I am going to try it next time we go to Armier.